Rodney Dangerfield will always be renowned as one of the true legends of stand-up comedy. He’s one of the few comedians who could make an entire concert hall full of paying customers collapse into hysterical fits of laughter simply by saying one line; “I don’t get no respect!” As a kid I used to see him all the time on “The Ed Sullivan Show” and “The Tonight Show” but I really didn’t understand his style of comedy until I was older. And certainly by the time he began making it big in movies like “Easy Money” and “Caddyshack” I was able to properly appreciate his humor and his jokes. Now most people hold up “Caddyshack” as the height of his movie career but for me it’s BACK TO SCHOOL. It’s one of the few comedies that I’ve seen multiple times but laugh every single time I see it as if I’m watching it for the first time. It’s got a great eclectic supporting cast; Sally Kellerman, Keith Gordon, Paxton Whitehead, Ned Beatty, Sam Kinison, Terry Farrell, M. Emmet Walsh, Burt Young, Adrienne Barbeau and Robert Downey, Jr. 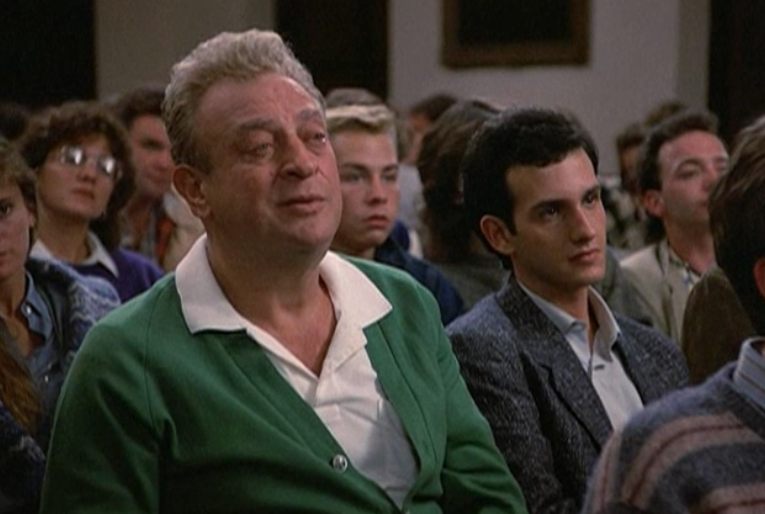 But for me the main attraction is Rodney Dangerfield front and center playing a really great, larger than life character as he breezes through the movie throwing off one-liners with a speed and delivery that would make Groucho Marx dizzy with envy. Thornton Melon (Rodney Dangerfield) is the poster boy for self-made millionaires. He’s taken his immigrant father’s humble tailor shop and turned it into an national chain of Tall & Fat Shops. He went on from there to diversify until now he owns Melon Enterprises, a worldwide corporation. Thornton Melon is far from being a stupid man and in fact is quite intelligent and street smart, despite his boorish, rude and crude manner. But his one great regret is that he never got a proper education. He’s determined that his beloved son Jason (Keith Gordon) will get one at the prestigious Grand Lakes University. After getting rid of his gold-digger of a wife (Adrienne Barbeau) Thornton heads to Jason’s college to surprise him along with his best friend/bodyguard Lou (Burt Young) and gets a surprise of his own: Jason had been telling his father he’s a straight A student and a star on the university diving team. Turns out that Jason is the team’s towel boy and a lousy student. Jason wants to drop out but Thornton hits on a novel idea to motivate his son: he and Jason will go to college together and both of them will get a proper education. 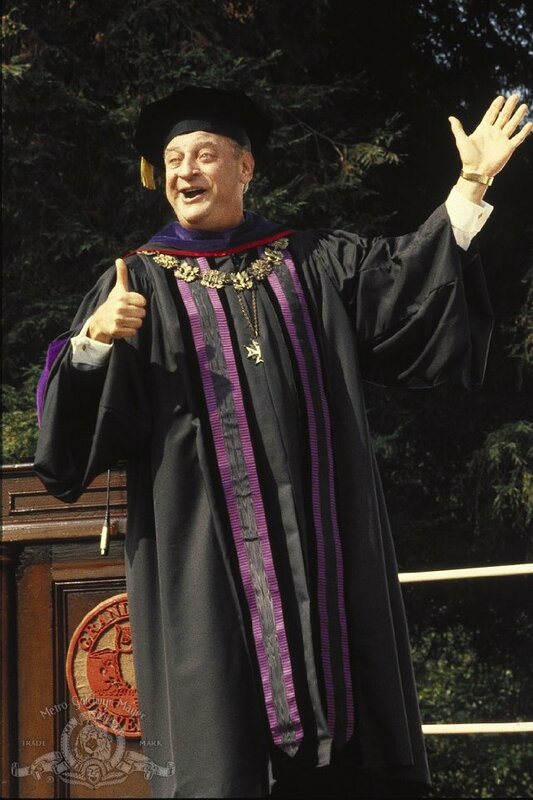 The fun of BACK TO SCHOOL comes from seeing Rodney Dangerfield’s Thornton Melon effortlessly cause utter and total havoc while navigating his way around every obstacle with either his street smarts or his money. Upon being told he’s too old and too unqualified to attend the university, he promptly donates funds for the new Thornton Melon School of Business and before you can say ‘holla’ he’s registered. He turns his cramped dorm room into a luxury condo complete with hot tub. When he has problems writing a paper on the works of Kurt Vonnegut he calls up Kurt Vonnegut and has the writer flown in to the college for a session with Thornton so that Vonnegut can personally explain the meaning of “Breakfast of Champions” to him. When he throws a party he hires Oingo Boingo to play and has the campus cops deliver his booze and beer. But the story takes a nice turn in that Thornton’s plans actually inspire his son to genuinely want to do better and become a good student while his dad lives out his college life fantasies partying and having fun instead of studying and doing the work. It’s a lot of fun to see the father and son reverse roles as they help each other grow up. There’s a subplot with Thornton romancing his English professor (Sally Kellerman) that really goes nowhere but it’s always fun for me to watch Sally work. And it may seem unusual to have Thornton be a former champion acrobatic diver until you do your research and find that before he became a successful comedian, Rodney Dangerfield actually was a performing acrobatic diver. What else can I tell you about BACK TO SCHOOL to get you to see it? The scene in the college bar where Thornton sings “Twist and Shout.” The diving competition where Thornton performs ‘The Triple Lindy’ a dive so dangerous it can kill if not executed perfectly. Thornton’s final exam where he has to recite Dylan Thomas’ “Do Not Go Gently Into That Good Night” The movie gets a lot more mileage out of Ned Beatty’s character being named ‘Dean’ Martin than you would think. And the best thing I can tell you about BACK TO SCHOOL is that it’s simply a whole lot of fun to watch. The humor is fast, quick and the father/son story itself to me is quite heartwarming. Dangerfield and Gordon look nothing alike but they do have great chemistry together and they did convince me of their relationship. The entire cast looks as if they had nothing but fun making this movie. I know you’re going to have a good time watching it if you’ve never seen it. And if you have seen it before, it’s high time you watched it again. BACK TO SCHOOL is high on my personal list of The Funniest Movies Ever Made and I’m positive that after you see it, it will be on yours as well. Enjoy. Great review Derrick!! I’ve always thought (along with the Projectionist)- this was Dangerfield’s best film. Just don’t forget the cameo by Sam Kinison….loved their chemistry, and of course, Dangerfield was a great supporter of Kinison’s comedy! Not only was it hliarious but let’s not forget the absolutely delightful score by Danny Elfman, it’s as great as his Pee Wee’s Big Adventure music! I grew up watching this film on HBO with my siblings and cousins. The laughter was infectious. Especially, when the “Twist and Shout” and “The Triple Lindy” scenes came up. 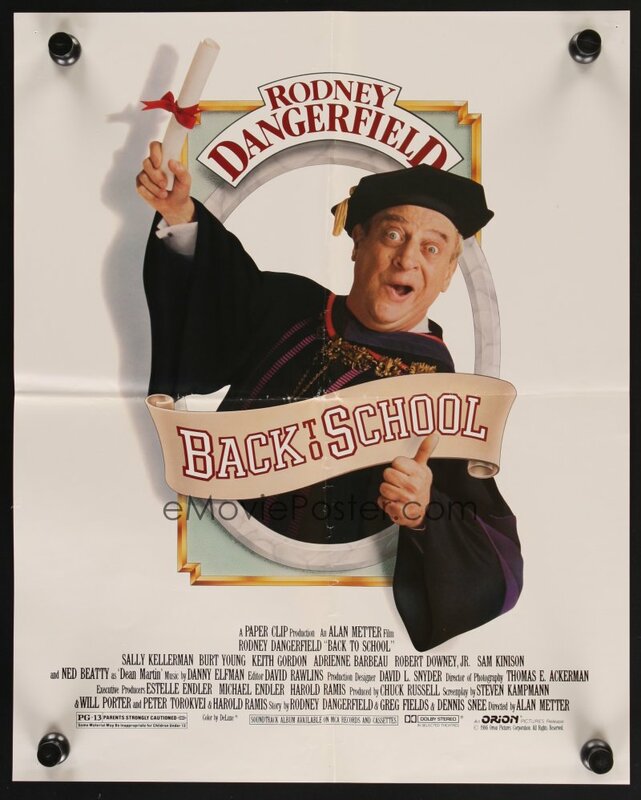 BACK TO SCHOOL is most definitely Rodney Dangerfield’s finest comedic performance on film. I highly recommend watching at least once. I, on the other hand, watch it several times a week. It never gets old. I distinctly remember seeing this movie back in ’86 in a Manhattan theater and the scene where Dangerfield, Downey and Gordon go through three separate doors only to find out that they all open into one huge condo was one of the biggest laughs of the movie. Man, I love this movie. When I got to Syracuse and moved into a 3-room suite my sophomore year, one of the first things I thought about was how Dangerfield reconfigures the dorm in BACK TO SCHOOL.